This was not Thanksgiving dinner. But the idea of Thanksgiving did put us in the mood for a roast bird of some sort. 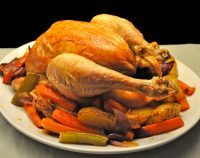 The idea of cooking a Thanksgiving dinner (which I have done when I lived in the U.S.) made me want to do something easy. It doesn’t get much easier than this – the whole dinner roasted in one pan while I sit with my feet up and a glass of wine. Put the lemon inside the chicken. Do not salt, butter, oil or anything else. Put breast side down in a roasting pan and roast at 350F for 30 minutes. Toss the vegetables with the oil, paprika and salt. Turn the chicken over (so it’s breast side up), put on top of vegetables and roast for 30 minutes. Turn the oven to 400F and roast for 25 more minutes. Skin should be golden brown and puffy. Remove, let rest for 10 minutes. Stir vegetables.Turn the oven off and put the vegetables back in the oven while chicken rests. Carve chicken and serve with vegetables and pan juices. In my French conversation class the other night we were discussing Santa Claus / Father Christmas / Père Noël. When I was a child we wrote a letter so Santa Claus before Christmas. At our house the letter was put in an envelope, Santa Claus was written (or printed) across the front and it was left somewhere in the living room where, my parents assured us, it would be found. Sure enough the next morning it was gone, retrieved by one of Santa’s elves whose job it was to collect the letters from all the children. We waited anxiously until Christmas to see if Santa had indeed read our letter and granted us at least a few of our wishes. We were always told that not every child could get every toy that they asked for. I have no idea if children still write letters to Santa. Or maybe then send an email or a text? Here in France they still write letters. But the rest happens a little differently…. Père Noël is scribbled on the front of the envelope and it’s dropped in the post box or taken to the post office. An address isn’t needed because everyone knows where he lives and stamps aren’t needed because… well, just because. But you have to be sure to put your address in the letter so Père Noël knows where you live. Père Noël carefully reads all of the letters – and answers them. Every letter gets an answer. What actually happens is all of the letters end up in Libourne, France where a staff of helpers write the return letters. Actually, anyone can write to Père Noël at Libourne, France and get an answer. Last year they answered 1.2 million letters to children in over 140 countries. And, lest you think Père Noël is a luddite, 91,000 letters were received via email. Have you written yours yet? There is (to me) an astounding discussion in the USA about whether to clean chickens before cooking them. Report(s) are cited stating that doing so splashes water about the kitchen can cause bacteria to get on other objects, and cause illness. My thought is that if one is so clumsy as to splash water around the kitchen, maybe one should rethink more ominous tasks such as holding a knife or taking up an egg in hand. Splashing water everywhere? It’s a kitchen, not a water park! I’m not overly concerned about washing my food – I don’t bother with most fruits, for example and would never touch ‘produce soap’. (I know, shame on me.) But, yes, I rinse out my chickens and manage not to destroy the kitchen. Frankly, I’m more concerned with getting the rest of the feathers off….. And sometimes they are not quite as thoroughly gutted as they should be. This is France, after all…. At least now I can buy them without the head and feet. I am writing mine tonight…cannot quite see a Pere Noel scribe/elf sending me a reply to a Xmas free country !!!! Have a little faith…. so to speak.